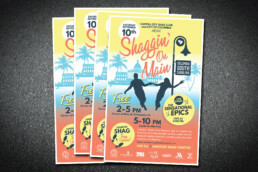 The Capital City Shag Club and Mayor Steve Benjamin teamed up with Post No Bills to create the marketing materials for their “Shaggin’ on Main” event in downtown Columbia. 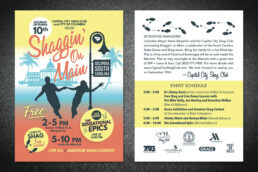 Committed to helping this local event gain the credibility it desired and the look of a national affair, our team developed high end materials on a limited community budget. Our attention to detail captured the minds and hearts of the community as they gathered to celebrate the state dance in a new and memorable way.